A sign board displaying Toronto Stock Exchange (TSX) stock information is seen in Toronto. The S&P/TSX Composite Index is again overbought and vulnerable to a short-term correction, according to Relative Strength Index (RSI). The benchmark’s RSI reading as of Thursday’s close is 73.6, above the sell signal of 70. The index gained 0.9 per cent for the week and stands 2.1 per cent higher for 2018. There are only three oversold, technically attractive index members this week trading with RSI levels below the buy signal of 30. Chorus Aviation Inc. is the most oversold stock in the benchmark, followed by Prometic Life Sciences Inc. and WestJet Airlines Ltd. 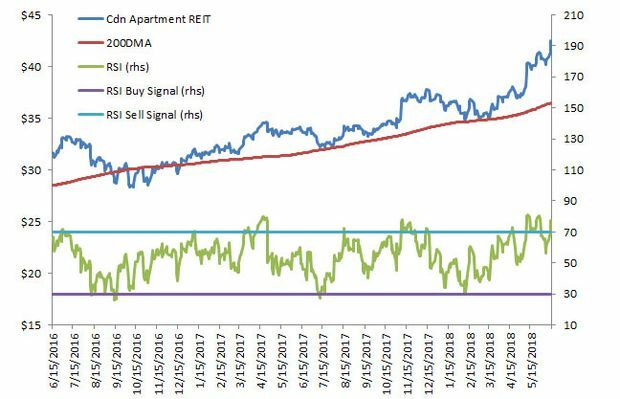 I picked an overbought stock – Canadian Apartment Properties REIT – as the focus chart this week. The trust’s unit price jumped 5.1 per cent for the week ending with Thursday’s close, and it’s now the second most technically extended benchmark stock (behind Valeant Pharmaceuticals International Inc.). The supportive influence of the 200-day moving average trend line is the most obvious trend on the chart. In July 2017 and through the February-March 2018 period, price declines halted right at the trend line before new rallies began. RSI sell signals were broadly effective in warning investors of temporary declines in the price. In April 2017, a sell signal was followed by 6.9-per-cent decline by the end of July. A November 2017 sell signal kicked off a sideways move for the price and eventually a 5.4 per cent decline by early February of this year. More recently, two RSI sell signals in May predicted marginal price declines before the strong rally resumed. Based on 2018 patterns, there does not appear to be risk of anything except a small decline in the near term, but potential investors would be well served to wait until the RSI reading falls below 70. There are 30 overbought, technically vulnerable S&P/TSX Composite companies according to RSI this week. 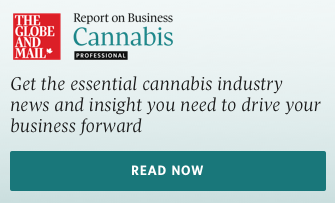 Valeant and the Canadian Apartment REIT lead the way as mentioned, followed by Canada Goose Holdings Inc., Brookfield Asset Management, Hudson’s Bay Co., Firstservice Corp., TFI Internetional Inc., WSP Global Inc., Morneau Shepell Inc., Shaw Communications B and Kirkland Lake Gold Ltd.